People have been using computers for typing and printing Kannada text for more than 25 years. Majority of the usage of Kannada on computers was limited in the DTP arena. 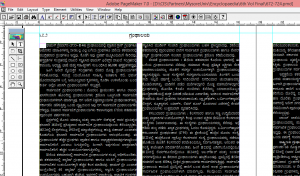 People made use of packages like PageMaker (Version 6.5 or 7) to type and compose the pages. Even now many people still use these packages for Kannada DTP work. The text entered into these packages is actually stored as font glyph codes rather than character encodings. Non-Unicode truetype fonts like Nudi, Baraha, ShreeLipi, Akruti, etc., are some of the most popular fonts being used. The system does not understand these characters as Kannada characters. Any text based operations like search, replace, sorting, spell-check, text-to-speech, etc., are not possible with this kind of text. 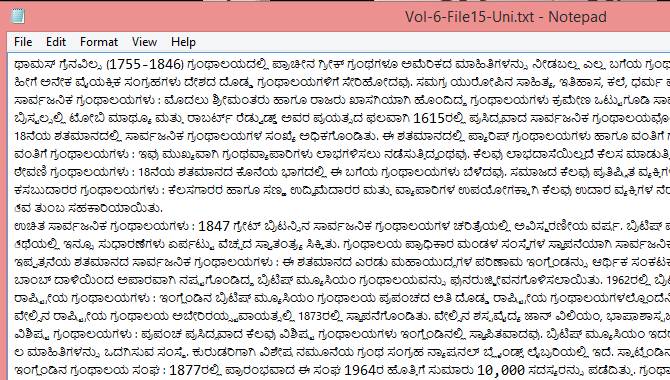 Employing Unicode for all digitisation works of Kannada text solves this problem. Usage of Unicode for Kannada has become prominent only recently. All websites like Facebook, Twitter, Wikipedia, Wikisource, etc., want the text in Unicode only. There is still a large amount of text entered and stored with old non-Unicode font based encodings. These are mostly present in the form of PageMaker files. 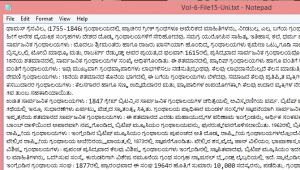 This blog explains the process of converting the text present in PageMaker into Kannada Unicode text. Kannada and Culture Department of Govt of Karnataka have released Unicode complaint opentype fonts and Unicode based software for Kannada under GPL. These are available for free download at their website. 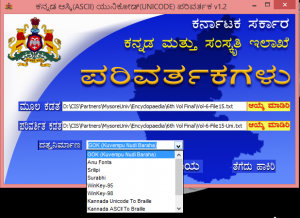 Download and install “Ascii to Unicode Kannada Converter” from this page. This software works in Windows only. 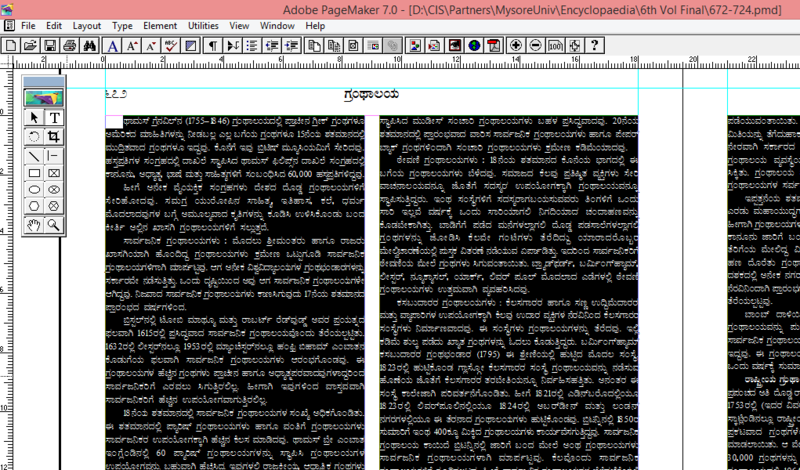 Now you are ready to convert the text from PageMaker file into Unicode. Open the PageMaker file. Select the Text tool depicted by a big “T” shaped icon. Click anywhere in the text area. Select the entire text (Ctrl-A followed by Ctrl-C). Now open Notepad and paste this text into that (press Ctrl-C). The text will appear gibberish in Notepad. Don’t worry about it. 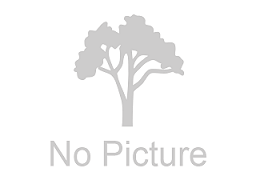 Save the file as plain text file (.TXT file). Remember where you have saved the file. Once the conversion is complete, it will display appropriate message to indicate the completion of the conversion. If you open the text file created by the software, it will have the text converted into Unicode. This text can be used in Wikisource, Wikipedia, etc. ಇದಕ್ಕೆ ವಿರುದ್ಧವಾದದ್ದರ ಬಗ್ಗೆ ಮಾಹಿತಿ ನೀಡಿ ಸರ್.